As the winding road leads higher and higher, more and more peaks come into view. Soon we reach Logan Pass, the apex of the Going to the Sun highway. From here, we continue on foot to explore and get a better sense of this national park. A wooden boardwalk leads further up toward the continental divide, separating the flow of water to the Atlantic and Pacific oceans. Here, we are at the crest of North America. Yet, we are far from alone. As we round a bend in the trail, a herd of Bighorn Sheep graze only a few meters beyond. Somewhat ambivalent, yet keeping a cautious eye on us and our movements. They sense that we are not a threat, but likely a nuisance to their feeding in preparation for the impending winter. Signs of the rut are evident in their behavior, a few of the males stare each other down and clash their spiral horns against each other. Only a few paces further, around another bend, Mountain Goats come into view. Suddenly, we feel like outsiders, foreign to this natural beauty. These animals that have dwelt in these mountains for ages following the natural rhythm of the land and seasons. We are simply passing through, trying to get a glimpse of the natural beauty of the landscape and it's inhabitants. 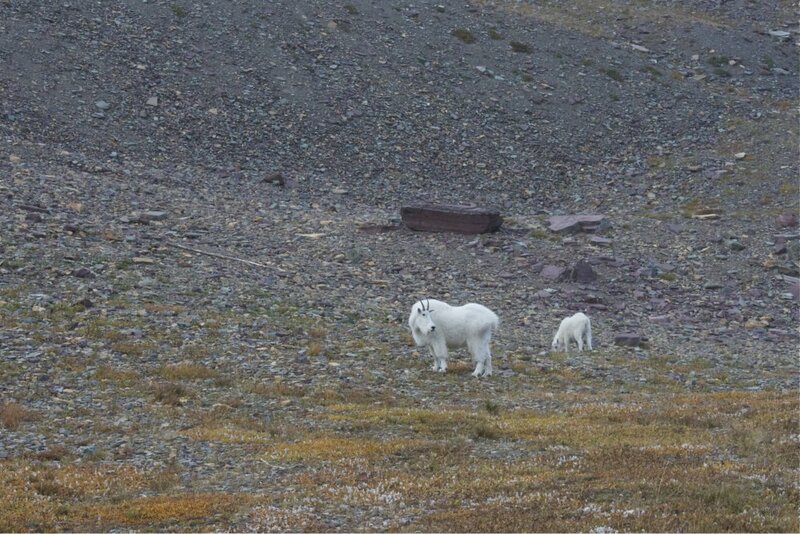 As we continue, more mountain goats block our path, mothers and their kids annoyed that we are in their way. There is a small sense of urgency, whether imagined or real. Winter is approaching and these animals must prepare for the hostile environment that will ensue. Further on, a solitary male, muscular and majestic, picks through the rocks for shrubs. Whole herds of these beautiful animals slowly come into view, seemingly oblivious to our presence. We try our best not to impede and keep to our little path. Soon we crest the mountain side to a pass that opens up with wide stretching views to the west of glacial lakes and glacier covered peaks. A fitting home to the animals we passed on the way up. With so much to see even the littlest of legs managed to ascend to these heights. We return to the road on the same path, yet the views are different. 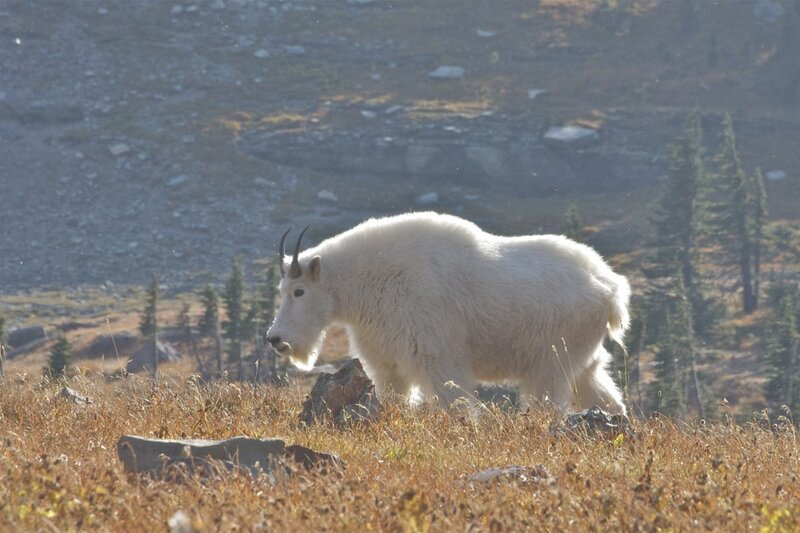 We see the landscape from a different angle, and new flocks of mountain goats come into view. We are the last ones on the mountain it seems, it's just us and these wild animals. The sun begins to fade as we reach the road and as we finish eating dinner a herd of White Tail Deer come to wish us good night and lick the salt from the asphalt. In the middle of the night a storm moves in. We wake to misty skies and obscured peaks. The scenery continues to be magical, but less inviting. We aren't finished with Glacier National Park, so we drive into the next valley further north hoping the weather holds. As we stop to admire the autumn colors along the way, the faint bugling of elk can be heard in the distance. The park feels deserted, we drive along at a leisurely place along the narrow valley floor anticipating the unexpected. Another car parked in a narrow turnout causes us to stop and look. 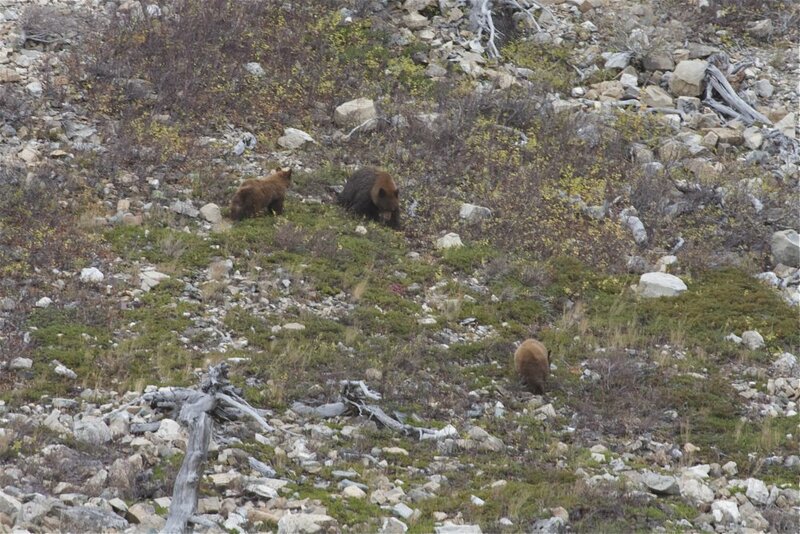 Up on the mountainside just a few hundred meters away, a mother Grizzly and two cubs scavenge for food among the talus. From this safe distance we can observe unnoticed. We watch as they slowly make their way across the slope. As the clouds threaten, we continue onward deeper into the hart of the Many Glacier valley. Reaching the end of the road we gaze skyward scouring the mountainsides for life. 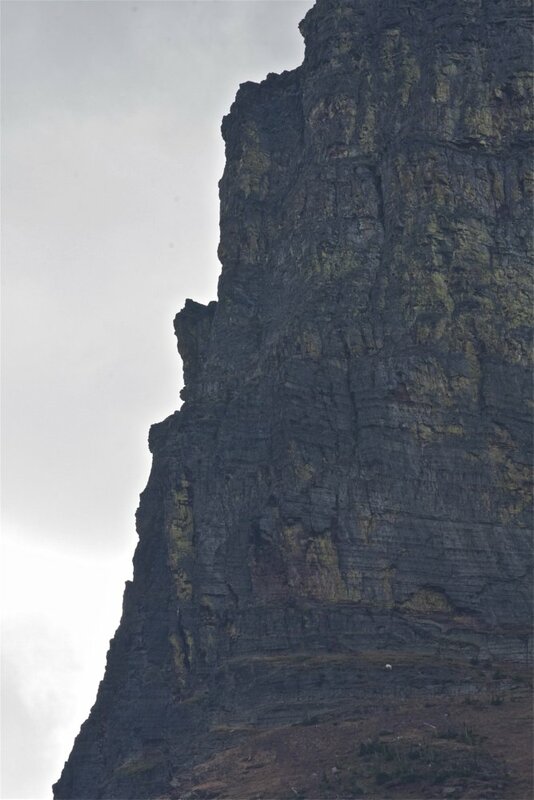 Amazingly, solitary mountain goats cling to rocky ledges far above. We can only wonder why these animals choose to inhabit such seemingly inhospitable places. Perhaps they, like us, seek out better views and greater adventure. As the storm gains momentum, we descend out onto the plains of the Rocky Mountain Front Range. The contrast to the peaks we leave behind and their wildness seems abrupt. For the first time in our journey we begin our travels south. 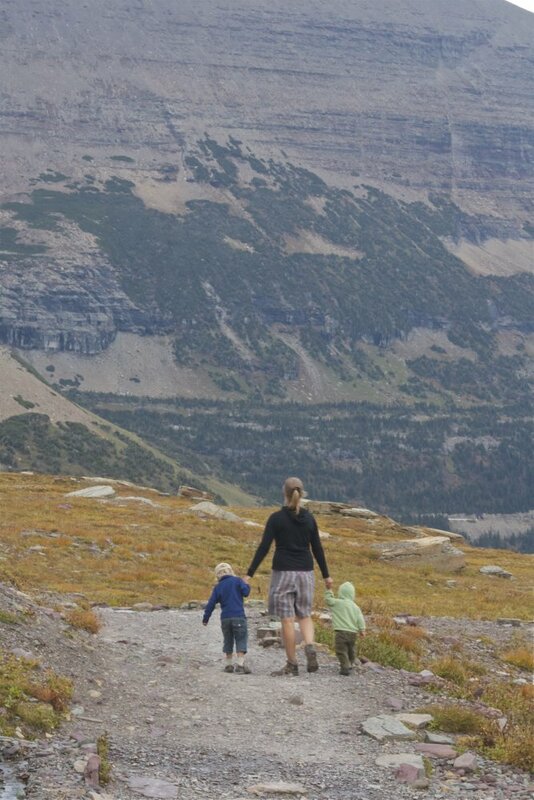 Glacier National Park gave us more than anticipated, from the wild landscape to the beautiful animals. Hopefully these memories will follow us for years to come, and inspire our children to return.